his is a portable program for financial calculations and could run in any computer device in any resolution. You only need to install Java 1.8 (Java 8) or newer one. By this program you could have a variety of financial calculations more accurate than normal programs. This program shows large numbers without showing them in exponential form. This program could translate into any language. This program has two official languages (English and Persian) which you could use them for creating translated language file. You could change the font and font size and select any of them which installed on your device. All parts of the program could be customized to any color you want. You could save the result of the calculation into the text file or save it into the database of the program which shows on top of the each section. 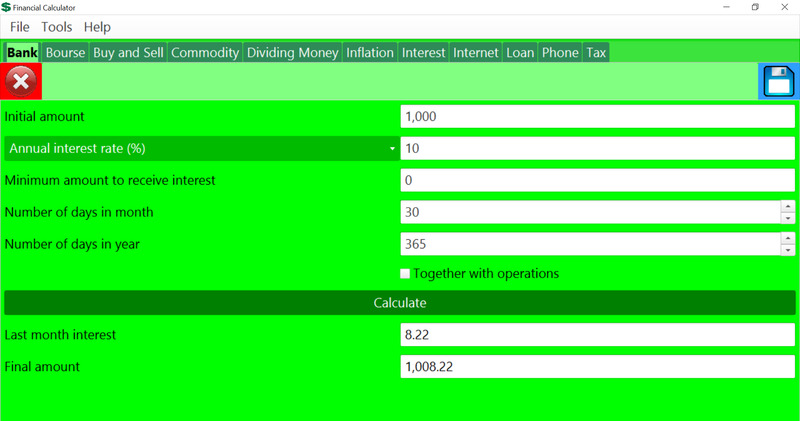 This program has 11 parts for 11 different financial calculations. Could run in any computer device in any resolution of monitor. This program shows large numbers without showing them in exponential form. This program could translate into any language.